EVER HAVE DREAMS IN WHICH YOU ARE FALLING OR FLYING? THOSE ARE PROBABLY INSTANCES OF ASTRAL PROJECTION !!! Astral projection is EASY and NATURAL.!!! Your soul leaves your body EVERY NIGHT as you sleep!!! 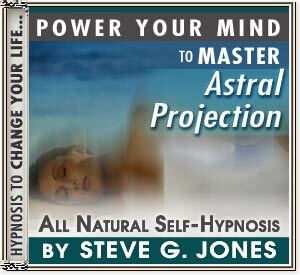 WITH THIS NEW SELF HYPNOSIS CD, YOU WILL LEARN HOW TO HARNESS THE POWER OF ASTRAL PROJECTION. The concept of Astral Projection is as old as the concept of living beings. All living beings possess an Astral body. This body is connected to the physical body through the umbilicus along what is known as the silver cord. The Astral body exists in the fourth dimension and is not subject to the restraints or either time or space. Therefore, when you travel in your Astral body you can travel great distances in seconds or even instantly. It's important to keep in mind while learning to Astral Project that imagining back in your physical body will immediately return you to your physical body. However, the nearest comparison I can think of is sandcastles. They strongly resemble sandcastles on the beach yet they are larger and far more intricate. It's also interesting to note, that when I astral project I can see things more clearly than I can with my physical eyes. Objects appear crystal clear to me when I Astral Project.